I work at the Peterson Institute for International Economics in Washington. I have been employed by a (White) House, a (World) Bank, and a (WTO) Secretariat. For twelve years, I was a professor. 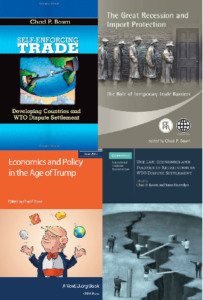 I write about international trade. Books, research articles, short columns, long columns, tweets, you name it. Find them archived here. I talk about international trade. With Soumaya Keynes of The Economist, I co-host a weekly podcast on the economics of trade and policy.